Hello everyone…I would just like to take a few minutes to say something that upset me a bit yesterday. The photo of the salad I have posted does not do justice for how it actually looked when I took the picture. Yesterday, I posted this on Instagram, and I receive a not so very nice message about my photo, which I do understand not everyone needs to like what I do and that is completely understandable. I myself sometimes see things that discourage me a bit, but the difference is that I would never intentionally or unintentionally go out of my way and hurt someone because I am not that kind of a person. I just don’t like hurting anyone’s feelings at all. So, back to this lovely salad, I was given quite a few beets the other day, and Mangos too so I will be posting a Mango smoothie next time…hahaha just so you know. From what I know Beets are usually sold with the green stems in Greece, and in other countries but here in NL they cut off the stems and sell them separately, I have no idea why but this is how I have seen them. I did go into the fruit and vegetable market and asked the lady who owned the store and she really had no response to why they cut them off. So, I just left it at that and went on my way. The Beets that were given to me were already boiled. So, if your going to buy fresh Beets, cut off the skin before boiling. Place into sauce pan and cover with just enough water and add a bit of salt. In a plate or bowl add Spinach that has been washed throughly and drained. Add a layer of the sliced or cubed Beets. Top with the Aioli. (I usually make my own Aioli otherwise known in Greek as Skordalia which I have already planned to post in the next few weeks, but ready made Aioli works just fine). Top with Walnuts, Drizzle Olive Oil, White Vinegar or Lemon Juice and enjoy. Hi Sophie, I just reblogged your lovely Spring Roasted Veggies post. Thank you!!! Thanks so much Vero!! I hope everything worked out ok with your car. People can be so nasty! Sophie, pay no attention to said troll. I enjoy your photos. 👍 This salad... yummy! I love, love, love beets! Thank you and I wish you the same. 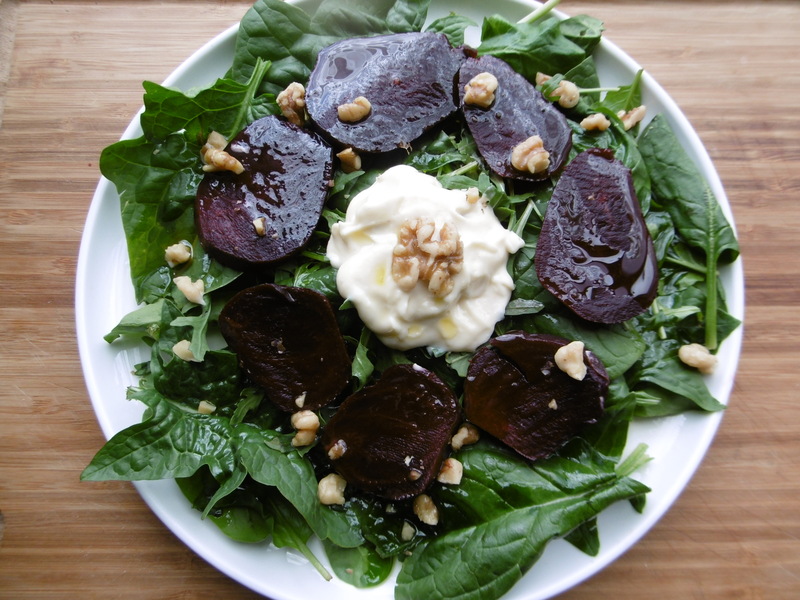 Healthy eating with added beets...Love it!!! Your salad looks so fresh & wholesome ! love beets in my salad! wonderful recipe!